Intimus 16.50S (655924) Cross Cut Shredder is represents the very best of what data disposal markets have to offer. Developed with the needs of high-end industries in mind, it is integrated with cutting edge technologies. Equipped with a conveyor-powered feed unit, it can shred up to 330 sheets of paper simultaneously that can be as wide as 19.7”. Its powerful 7.5 kW motor gives it the capability of shredding documentation at a quick speed of 47 feet/min. Its wear-resistant high-grade steel cutting rollers can effortlessly shred materials like plastic cards, optical disks, and hard file covers. 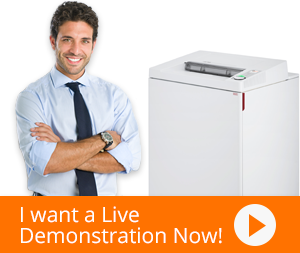 A shredder with its capabilities, it presents organizations with the perfect data disposal solution. 16.50S (655924) Cross Cut Shredder is not only one of the most able shredders but also one of the most easy to use. This heavy duty shredder is remarkably precise in its automated operations due to the microprocessors incorporated in it. All operators have to do is to pass on commands via its user-friendly soft-touch keypad. Additionally, there are numerous status indicators that inform users of inconsistencies or prompt necessary actions both visually and audibly. 16.50S Cross Cut Shredder deals with jams in its shredding unit automatically by reversing the motor whenever a jam is detected, facilitating users by saving their time and effort. This shredder is also amazingly safe to use. An easily accessible emergency stop bar is placed on the front panel for emergencies. Additionally, it has adequate safety features for both operators and its own internal components. Lastly, this top of the class product has a sizeable compartment for catching shreds that leave the cutting unit. With a capacity of 118 gallons, it makes waste management a convenient task.